AFTER a refit lasting 16 years, the most feared robots in the universe are once again threatening Earth. This time, though, they are equipped to overcome their greatest obstacle, writes Ben Dowell. In previous series of Doctor Who, the Daleks were warlike metal aliens engineered by the evil Davros on the planet Skaro. They were beings of ruthless logic with one small but significant flaw: you could evade them by running up a flight of stairs. The upgraded versions take to the air using rocket-boosters, enhancing their ability to "exterminate, exterminate". The new Daleks are also bigger than the ones last seen in 1989 and have more lethal weaponry than the old guns that resembled sink plungers. But fans will have to wait: the evil forces do not appear in the first episode, to be shown on BBC1 on Easter Saturday. A leaked script describes how the new Doctor, played by Christopher Eccleston, star of Our Friends in the North, is more modern in his style of dress but retains the traditional police box Tardis and sonic screwdriver. 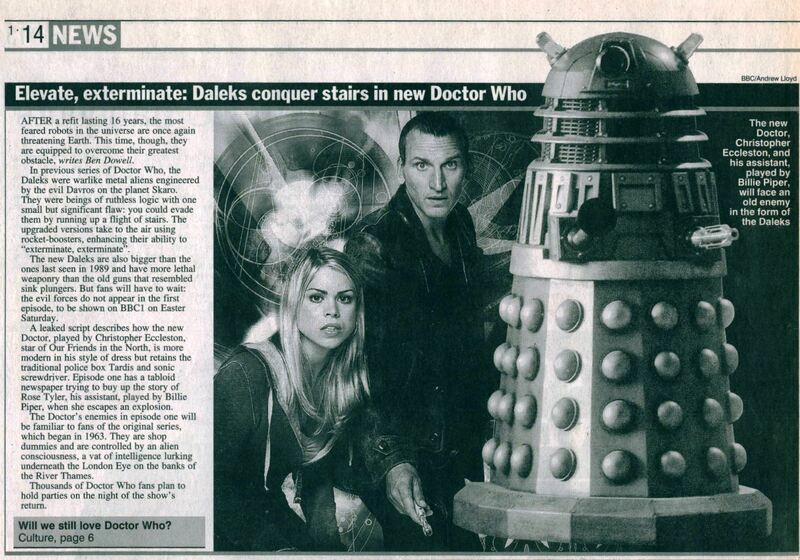 Episode one has a tabloid newspaper trying to buy up the story of Rose Tyler, his assistant, played by Billie Piper, when she escapes an explosion. The Doctor's enemies in episode one will be familiar to fans of the original series, which began in 1963. They are shop dummies and are controlled by an alien consciousness, a vat of intelligence lurking underneath the London Eye on the banks of the River Thames. APA 6th ed. : (2005-03-06). Elevate, exterminate: Daleks conquer stairs in new Doctor Who. The Sunday Times p. sec. 1, p. 14. MLA 7th ed. : "Elevate, exterminate: Daleks conquer stairs in new Doctor Who." The Sunday Times [add city] 2005-03-06, sec. 1, p. 14. Print. Turabian: "Elevate, exterminate: Daleks conquer stairs in new Doctor Who." The Sunday Times, 2005-03-06, section, sec. 1, p. 14 edition. This page was last modified on 1 July 2016, at 22:43.